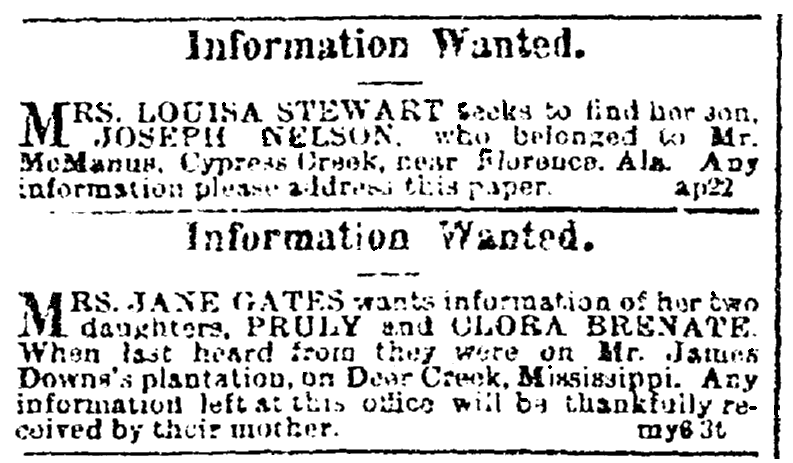 Introduction: In this article, Mary Harrell-Sesniak searches “missing person” ads in old newspapers to learn more about how newly-freed Blacks found missing members of their families after the Civil War. Mary is a genealogist, author and editor with a strong technology background. There is something tragic about the pain of families separated by war – even more so by those hurt by the two-fold tragedies of war and slavery. After the Civil War and emancipation of the slaves, there was much rejoicing – but how were Black families reunited? 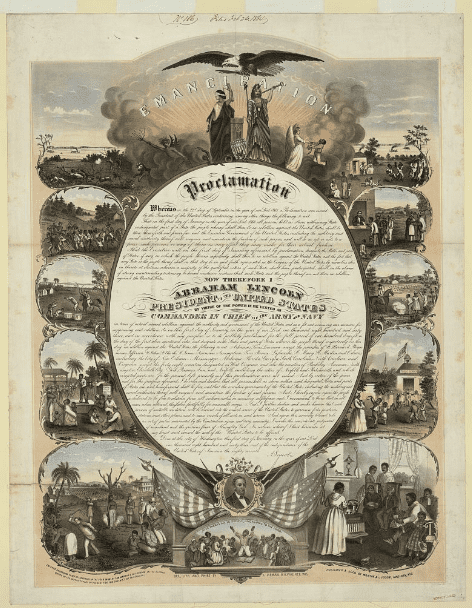 Source: Library of Congress Image of Lincoln’s Emancipation Proclamation LC-DIG-pga-02040 (digital file from original print). To view a larger copy, see http://www.loc.gov/pictures/item/2003671404/. Some had managed to follow the fates of family members, but others were sold and transported to far-away places. Keeping in touch with family members was in some cases virtually impossible. 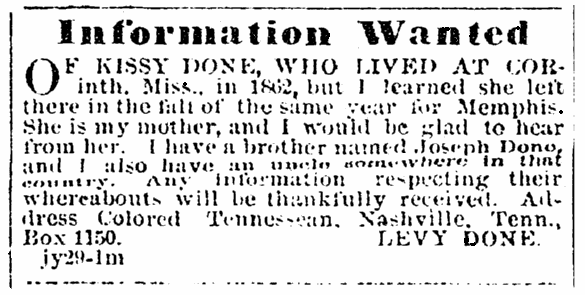 One of my earlier blog articles (Civil War Genealogy: Old Letters in Newspapers & Research Resources) examined how free families during the war communicated with missing members. Newspaper advertisements became the lifeline, and we see the same with the newly freed Black families after the Civil War. In the example below, Benjamin Branch is hoping someone can tell him the whereabouts of his missing wife Maria. Although the first African American newspaper appeared in 1827 (see: ‘Freedom’s Journal’: The 1st African American Newspaper Published in America), after the Civil War many more African American newspapers started to emerge. 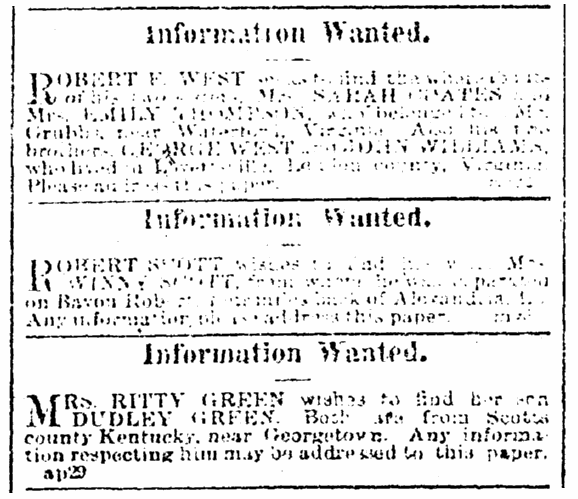 Publications such as the Black Republican of New Orleans, the Colored Tennessean of Nashville, and the Colored Citizen of Cincinnati printed numerous queries asking for information on missing persons. Since GenealogyBank has one of the largest and fastest growing collections of African American digitized newspapers, I’d like to share search tips to help build this powerful family history resource. Publishing a newspaper is an ambitious undertaking, but making one profitable and sustaining a subscriber base is even more difficult. As a result, newspapers came and went. Note this example: the Colored Tennessean of Nashville. This short-lived publication of editors W. B. Scott & Son began 29 April 1865 and ceased publication sometime in 1866. From the first ad below we learn: Henry Hill’s wife has a potential maiden or slave owner’s surname; where she was five years earlier; Hill’s occupation; and the street where he resided at the time of the ad. OF MY WIFE, LUCY BLAIR, WHO I LEFT in Jonesboro, Washington county, East Tennessee, five years ago. She was then living with William Blair. I was raised by John Blair. I am a wagonmaker by trade, and would be thankful for any information respecting her whereabouts. I am in Nashville, Tenn., on Gay street, north of the Statehouse. Address me or the Colored Tennessean, Nashville, Tenn., Box 1150. HENRY HILL. The second ad, placed by Levy Done, names his mother and brother as Kissy Done and Joseph Done, and mentions an uncle. OF KISSY DONE, WHO LIVED AT Corinth, Miss., in 1862, but I learned she left there in the fall of the same year for Memphis. She is my mother, and I would be glad to hear from her. I have a brother named Joseph Done, and I also have an uncle somewhere in that country. Any information respecting their whereabouts will be thankfully received. Address Colored Tennessean, Nashville, Tenn., Box 1150. LEVY DONE. At the bottom of many ads are details of how long the enquirer paid for the ad to be run. For example, the notation “Jy29-3m” indicates that Henry Hill’s ad commenced on 29 July 1865 and would run for three months. Levy Done’s ad started the same day, but would stop in one month. 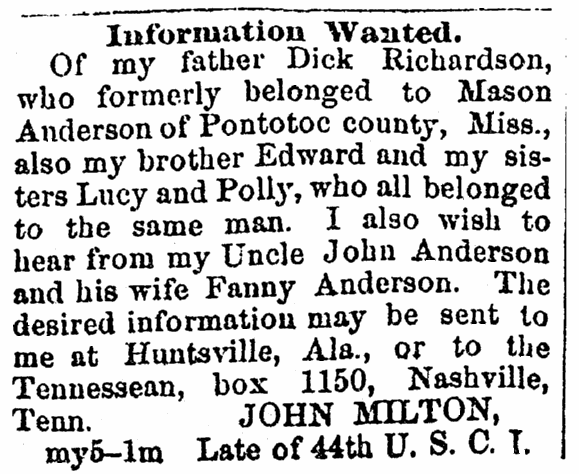 Genealogy Tip: If you can’t read a particular ad, look for a subsequent run which may be more legible. This is important, as you will see in some of the following examples that old newsprint often faded. 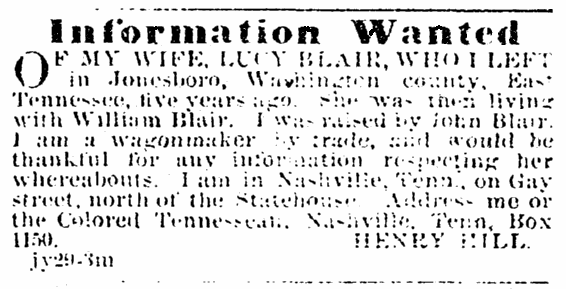 Civil War Service: This first ad was placed by John Milton of the 44th U.S.C. T. According to an article of 4 October 2010 at The Civil War Picket Website (accessed 9 April 2017), this group of Colored Troops was organized at Chattanooga, Tenn., and Rome and Dalton, Georgia. See http://civil-war-picket.blogspot.com for more articles. Recruitment of colored regiments began in full force following the Emancipation Proclamation of January 1863. 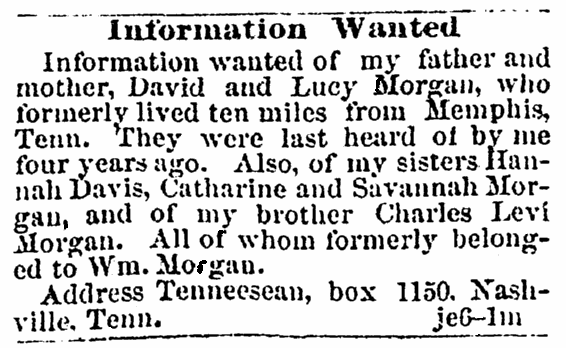 Last Contact: This ad confirms family connections of the David and Lucy Morgan family who formerly lived ten miles from Memphis, Tennessee, and who formerly belonged to William Morgan. It also states that no contact had been made in four years. Multiple Residences: This ad verifies family in three locations: a birth in Fairfax County, Virginia; a residence on Melpomene Street in New Orleans; and another on a plantation near Columbia, Arkansas. The pathos inferred in these ads is important reading. The family history information they contain is very helpful for genealogists. Further, I encourage all students of the Civil War to research these important aspects of Americana communications – and to join the task of adding to the Information Wanted project. Genealogy Tip: Don’t forget to look in multiple publications. When someone was clueless where family had ended up, it’s likely they placed ads in multiple sources. An article with search tips for using various sources to research Confederate Civil War ancestors. An article about Mayflower Pilgrim William Brewster based upon research in historical newspaper archives. Very interesting and sad at the same time. Thank you. I agree, but I was also quite happy to discover this type of communication was available in newspapers. I forwarded this article to David Jackson, the editor of MagicKC.org Genealogy Generations Journal.